These durable and versatile Q-Connect punched pockets are A3 landscape, but can be folded to A4 portrait to suit your filing and presentation needs. 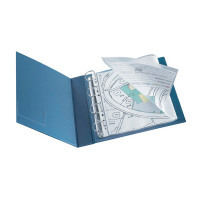 The multi-punched pockets are suitable for use in standard ring binders or lever arch files and are top opening for quick and easy access to documents. This pack contains ten 80 micron punched pockets.